Home-Start – have you done due diligence on game meat? 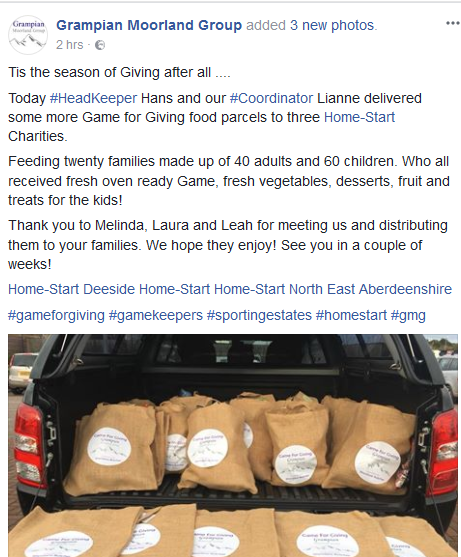 The Grampian Moorland Group is supplying game to local branches of the charity Home-Start. Home-Start is a ‘Family support charity, supporting families with a child under five, that helps parents build better lives for their children.‘. This may be happening elsewhere in the country too, for all I know. And for all I know great care has been taken to ensure that any donated game meat was shot with non-toxic, non-lead, ammunition. ‘The FSA’s advice since 2012 is that frequent consumers of lead-shot game should eat less of this type of meat. Eating lead-shot game on a frequent basis can expose consumers to potentially harmful levels of lead.‘ Food Standards Agency website. ‘There is no agreed safe level for lead intake. Independent scientific expert groups across the European Union advise that exposure to lead should be reduced as far as possible.‘ Food Standards Agency website. ‘Can lead shot and bullet fragments be present in game meat at levels enough to cause significant health risks to children and adult consumers, depending on the amount of game they consume? Yes, almost certainly. In the order of 10,000 children are growing up in households where they could regularly be eating sufficient game shot with lead ammunition to potentially cause them neurodevelopmental harm. Tens of thousands of adults, including pregnant women and their unborn, are also exposed to additional lead by eating game as part of their normal diet lead exposure, and this could potentially cause them a range of low level but nonetheless harmful health effects.’ Report by Lead Ammunition Group to Defra and FSA, June 2015. ‘Are safer alternatives to lead ammunition available that would remove all the problems in one go? Yes, there is experience from other countries where the change has already been made. There are issues to sort out and time would be needed for any phase out/phase in – and it would be controversial and resisted to start with – but changes could be made quite quickly and at relatively low cost with obvious benefits to wildlife, human health, the image and reputation of shooting sports, secure game markets, and a new platform for dialogue to solve other conservation and land-use issues. Such positive benefits are already apparent in countries that have already made the change to non-lead ammunition.‘ Report by Lead Ammunition Group to Defra and FSA, June 2015. ‘What are the options for dealing with the human health problems? The only way to guarantee the mitigation of human health problems arising from consuming meat from animals shot with lead ammunition is to replace it with non-toxic alternatives. There is as yet no convincing evidence that options short of replacement of lead ammunition will address known risks to human health and especially child health.‘ Report by Lead Ammunition Group to Defra and FSA, June 2015.
read and understood the science of health risks to people eating lead-shot game (especially small game (birds, rabbits etc rather than deer) like Pheasants and Red Grouse? asked your suppliers whether they have tested the lead levels in the meat that they are supplying to you? asked your suppliers to supply products which were killed with non-toxic ammunition instead of lead? recorded, or do others, the number of game-based meals supplied to individual recipients of these meals in order to measure or regulate dose? FareShare can accept wild game providing it meets EU standards for human consumption. Following FSA advice, we are unable to redistribute game to charities where pregnant women or women trying for children, toddlers or children are being fed. Wild game products must always be accompanied by on-pack labelling guidance regarding frequency of use and suitable consumers. You haven't mentioned the more recent Italian study, Mark? Ed - I haven't mentioned this either https://www.scientificamerican.com/article/wild-game-deer-venison-condors-meat-lead-ammunition-ban/ I haven't mentioned many things - obviously! But I have mentioned major reviews and the FSA's advice which still stands. No, but you're quite happy to use quotes from a flawed LAG report! James - what are the scientific flaws you had in mind? James - thank you very much for sending me off to bed chuckling. Ho Ho ho!!! Which Italian study? Do you mean Fustinoni et al. (2017), the one where hunters had significantly higher blood lead levels than non-hunters, but in which people who ate game meat weren't shown to have higher blood lead levels than those who didn't? I hope you're not hanging your hat on that, given that the group who ate game meat in this study were not clearly separated into those who ate farmed venison (i.e. not killed with lead shot) versus those who shot hunted game, while 40% of the "game-eaters" ate it less than once a month. The study could also only find 25 non-game eaters, compared to 70 game eaters, raising questions about sample size. Indeed the authors explicitly state that "reasons for the highest Pb-blood levels are under investigation, but the presence of fragments of shot ingested with game meals cannot be excluded". The authors also note their findings are only relevant for occasional eaters of game meat and reference studies where people eat game meat weekly or more often that show a clear link with increased blood lead levels. By contrast, they excluded participants who had eaten game meat in the last week. The authors speculated that the reason for the increased blood lead levels in hunters recorded in their study might be from lead entering the hunters' blood streams via fumes or merely handling lead shot. I respectfully suggest that there is a more plausible route that has indeed been well documented in numerous other studies. As does the Italian study, Mark. I don't want to be rude, Edward, but if you consider the following rude, then so be it. Your comment is simple trolling. Hugh discusses the nature of the report above, as others have done before. It's a study which can be criticised in many ways not least that it doesn't draw any statistically or scientifically valid conclusions. Now I take it you know all of this, because you wouldn't draw attention to a study that you had not read or did not understand. And yet you limit yourself to cryptic references to it (if they are to another study please let us know.) Why? It seems to me that you are trying to create doubt when there is none without yourself actually saying anything that can be subject to normal scrutiny. That's trolling. No Mark, although fibre wads are mandatory. Mark, the risks of eating lead shot game are minimal. Even prolonged eating. I know not of any of my father's era whom have ever had an illness relating to lead poisoning or eating game. Just stating a fact, Mark. That is all. Do the FSA also warn about the consequences of drinking too much water? Or what about rice? I would guess more of the population consume rice than game, but are they aware "Rice tends to take up more arsenic from the environment than other cereal crops, although this can vary according to variety and method of production. The arsenic in rice also tends to be predominately the more toxic inorganic form, which has the potential to increase risk of illnesses including cancer." Perhaps you' like to start another scaremongering campaign? James - not as far as I know, but they do warn against eating too much lead-shot game. A fact that you seem incapable of internalising. And game can be shot with non-toxic ammunition - but some people persist in using toxic lead ammunition. Crazy and difficult to justify on any grounds. Amusing you mention trolling, Mark was my very first internet troll! Ed - on your shoot, do you ask people to use non-toxic ammunition? Christopher - the option that I'd prefer is to be able to buy lead-free game meat - and that is indeed what I have in my freezer (plenty of venison). Tell me, where do I buy lead-free Pheasants? How about having high animal care standards in the food industry AND lead free game birds? It is not an either/or thing. The use of growth hormones is banned throughout the EU. I remember when I was asked to hand out the pencils at school...does this still happen ? and if so I hope that the little dears are not chewing the end as we did....mind you I have come to no harm from either that or eating shot game all my life...flippant perhaps but true. a pre cursor to a ridiculous claim made in respect of shot game products when we all know this is to do with morals rather than health.. I always smile at any remark which starts 'we all know...' - thank you for making me smile. Andrew, lead is a cumulative poison. It’s vital that kids are protected from it as much as possible. That's why lead was banned from all paint back in the ? early 60’s (the paint on pencils was definitely harmful). Lead free petrol came to the rescue next. The concerns and issues about this heavy metal continue – they are indeed moral ones. However, the morality of game shooting is irrelevant to the argument as to why lead ammunition should still be allowed to be sprayed into the environment when there are perfectly safe and effective alternatives. I didn't know whether to like or dislike this comment, it's made my day. Are you sure where your last pheasant meal started its journey from? Without wanting to be flippant is it possible that feasting on lead shot game over many years has contributed to a belief that pencils are made from the same stuff? Always good to see someone thinking about the issues. Sorry, I tend to forget that irony rarely works on social media. For the avoidance of doubt, it seems to me that Roger Sleigh's post is ill-considered. Unless he believes in poisoning people less well off than him. I guess the longer the shooters are on this blog the safer our wildlife is! Another cynical ploy to try and popularise game to justify shooting it.